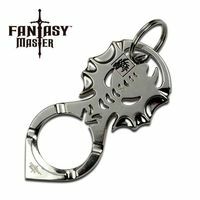 The Fantasy Master Skull Kubotan(kubaton) Keychain is your best pocket pal. Its always there when the chips are down and can bust through a thick skull in no time at all. 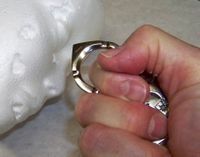 Its a unique self defense device that can be concealed until the last minute and then deployed as a force multiplier against the soft tissue and bone of your target. This product is for self defense purposes only. Made of lightweight cast aluminum, you hardly know its there until you place your hand on it. Only 3.5 inches in length and 1.75 inches wide its always handy. (5mm thick and very strong). 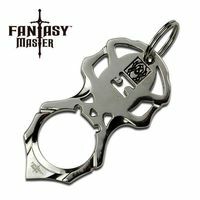 Includes Key Ring. Also available is the Spider Kubotan and the Dragon Kubotan both the same size as the Skull Kubotan (FM653SK). 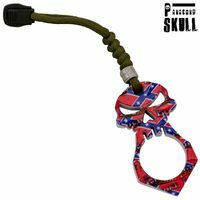 New to this lineup is the Dixie Rebel Kubaton with Stars and Bars design. Just under 3 inches long and 1.5 inches wide.